If you’re using RabbitMQ for distributing work to background dynos hosted by Heroku, GuvScale can monitor the queues for you and scale the number of workers up and down automatically. We originally built the guv tool back in 2015, and it has been used since by The Grid to manage their computationally intensive AI tasks. At The Grid we’ve had GuvScale make hundreds of thousands of scaling operations per month, running background dynos at more than 90% efficiency. This has meant being able to produce sites at a consistent, predictable throughput regardless of how many users publish things at the same time, as well as not having to pay for idle cloud machines. There are many frameworks for splitting computational loads out of your main web process and into background dynos. If you’re working with Ruby, you’ve probably heard of Sidekiq. For Python there is Celery. And there is our MsgFlo flow-based programming framework for a more polyglot approach. If you’re already using one of these with RabbitMQ on Heroku (for example via the CloudAMQP service), you’re ready to start autoscaling with GuvScale! $ heroku authorizations:create --description "GuvScale"
Copy the authentication token, and paste it to the GuvScale dashboard that you can access from your app’s Resources tab in Heroku Dashboard. Once GuvScale has an OAuth token, it is ready to do scaling for you. You’ll have to provide some scaling rules, either in the GuvScale dashboard, or via the heroku-guvscale CLI tool. Once GuvScale has been configured you can monitor its behavior in the dashboard. 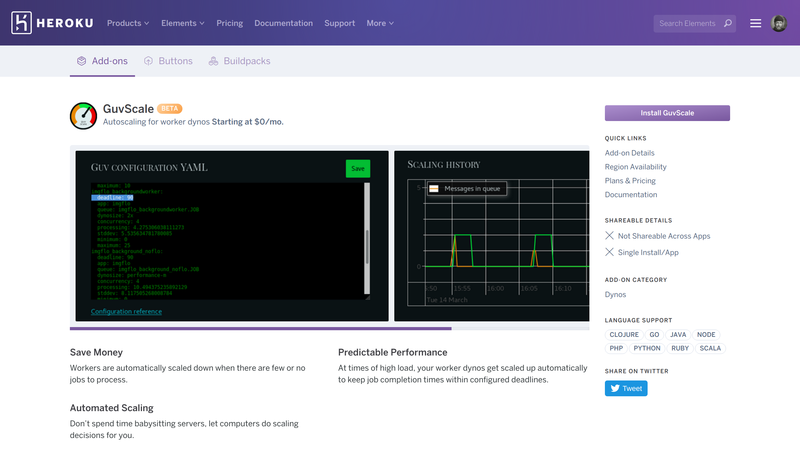 Read more in the Heroku Dev Center GuvScale tutorial. GuvScale is free during the public beta. Get started now!